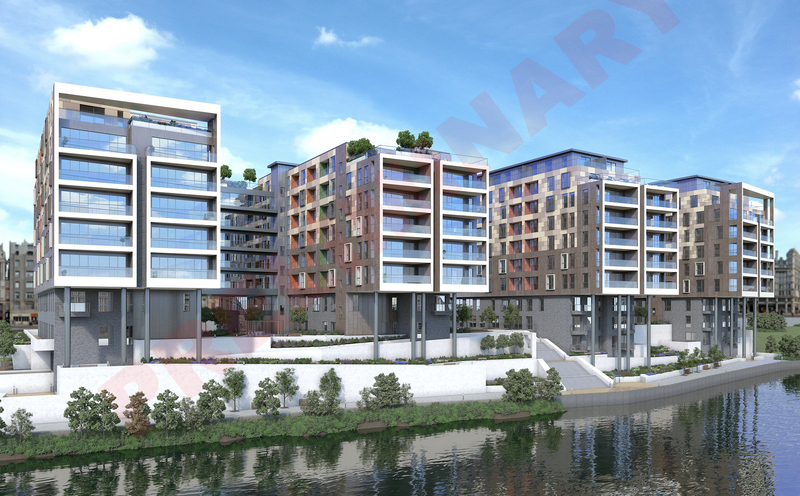 Phases 2 and 3 of the Adelphi Wharf development in Salford are a continuation of the response to the strengths of the riverside context exemplified by Phase 1, with a mix of public and private realm spaces fully integrated with a riverside walkway and Westward views towards “The Meadow” public park. Balconies and outdoor amenity spaces have been positioned and orientated to follow an identical strategy. Both phases comprise U-shaped blocks of approximately 180 residential units of 1, 2 and 3 bedroom apartments and duplexes, arranged over 8 storeys and linked with 2 further levels of secure underground parking. Each phase also includes a 3000sq ft retail unit, forming active frontage onto Adelphi Street. The landscaping strategy has been carefully developed to produce 2 semi-public outdoor areas within each of the phases’ courtyards, and a publicly accessible landscaped corridor separating the two phases. The landscaping sweeps down from the outdoor amenity areas at street level to the riverside walkway below such that the rear wings of each phase rise dramatically from ground level and address the river with breathtaking cantilevered overhangs supported by a procession of immense structural columns, which are themselves interweaved by the terraced landscaping creating spectacular seating areas beneath. 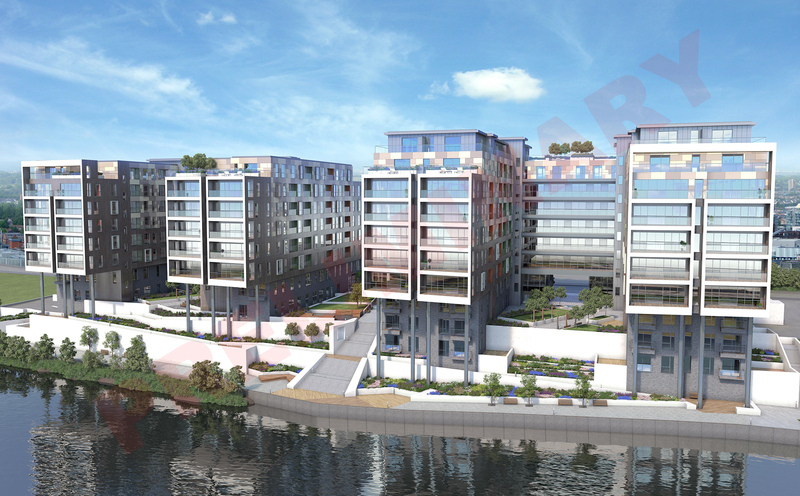 The uppermost levels incorporate communal landscaped terraces commanding panoramic views of both the riverside and the Salford and Manchester skyline. The architecture is an expression of solidarity and playfulness to reflect both the previous industrial heritage and Salford’s present flourishing as an academic and creative centre. At ground level the architecture exudes strength with the structural arrangement of columns, and the lowest levels formed by a podium of stout blue engineering brick. Conversely the upper levels are dressed with an inventive composition of lightweight cladding, including the reactive”Chameleon” panel which shifts visually in tone and colour as the observer’s viewpoint changes, accentuating the recessed balconies which these panels demark. Further drama is introduced with a unique covered portico at high level on each phase, which frames the view from the rear terraces over the river and towards The Meadow.